It is hardly possible to imagine a B2C world without Amazon, Apple, Google and Facebook. Platforms have long been among the world’s most influential and valuable companies. Now they are also in the process of conquering the B2B sector. Alone, in consortia or in partnerships, a host of companies have already started to build platforms. The key question is this: Will platforms revolutionise business between companies, especially in mechanical engineering, to the same extent that we have witnessed in the consumer sphere? Sceptics suggest that the mechanical engineering industry, especially in its classic Mittelstand form, is too segmented, too complex, too fragmentary and too specific for that to happen. Ultimately, they argue, the expertise of a company that makes cutting and winding machines, for example, is not really comparable with the vast world of book delivery, overnight shipping options or travel to end-customers. Platform-based applications are also becoming a decisive differentiating factor in mechanical engineering. That is correct. The market addressed by B2B platforms is never likely to attain the same size as the B2C markets. Scale effects are hardly comparable either. On the other hand, the disruptive potential of platforms has long been perceptible in the mechanical engineering sector, even if the corresponding ecosystem is still in its infancy. The German mechanical engineering sector is well-known for its varying branches and firms, which includes a range of diverse businesses and segments. And while a cross-industry platform, with its differentiated clientele and often complex product portfolios, is likely to be of interest to component manufacturers, make-to-order companies among OEMs are more likely to seek individualisation of services via the platform, simple process adaptation and rapid integration of new products. Consequently, the choice of the appropriate role and level for each particular firm in the platform ecosystem, or of the platform itself or of the best partner, is a highly individual decision that depends on many variables. To date, most German mechanical engineering firms still position themselves as classic OEMs or component suppliers at Level 4. They include pure hardware suppliers as well as companies with an integrated portfolio from the IoT ecosystem and hardware and software solutions. With internet-linked hardware, these companies benefit from automated processes and full data sovereignty. However, with part of their services – applications they have developed themselves or with a partner – they are also active on Level 3. The prospect of attractive new revenue sources and opportunities to differentiate products and services is currently luring many suppliers towards apps and software (Level 3). Application areas such as condition monitoring and operations optimisation are already, in many cases, being treated as particularly profitable “killer apps”. In fact, with an eye to the future, a growing proportion of sales in the platform economy is shifting from Level 4 to Levels 3 and 2. Most importantly, small and medium-sized industrial firms must therefore decide whether they want to expand their offer on their own or make use of a partner network. 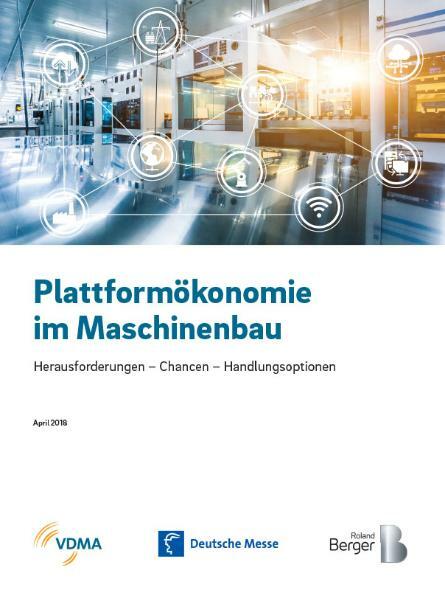 The platform situation in the German mechanical engineering industry is at an early stage of its lifecycle and is correspondingly in a state of flux. Many suppliers are experimenting in the search for a sustainable business model, a viable way of monetising their product offering and optimum differentiation from the competition. At the same time, many potential users are hesitating to join a specific platform ecosystem and are observing or testing the emerging options. A clearly defined platform strategy is therefore a must for every firm, regardless of which stage of digital maturity it has already reached. Firms with little previous knowledge of the platform economy may find a pure user role more appropriate, for example by buying simple manufactured parts from online marketplaces. That enables them to gain initial experience of using platforms without any major investment. Digital services also offer less complex options for entry. In contrast, firms at a more advanced stage of digital maturity should acquire experience with specific use cases that show promise from their particular point of view before envisaging comprehensive implementation. Platforms such as Amazon, Apple, Google and Facebook are now firmly established in the B2C world. In the foreseeable future, they will also establish themselves in the B2B environment.